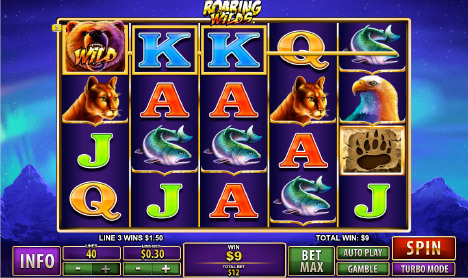 Fly Casino is pleased to bring you Roaring Wilds! This wild 5 reel, 40-line slot brings you the thrills of massive reel wins to go along with 15 free games bonus feature. This unique slot has four rows of stacked symbols per reel giving you the opportunity to line up huge winnings combination. Symbols include a wild bear on all five reels along with various wildlife representing your higher paying combinations. Roaring Wilds at Fly Casino fast, fun and payoff big when you get the right combinations. 100% Super Sunday! On Sunday from 00:00GMT until 23:59 GMT, all members on will receive a 100% bonus up to $/£/€200.00 on your deposit of $/£/€30 or more. 77% up to 144.00! From 00:00GMT until 23:59 GMT, all members on their deposit of $/£/€30 or more will receive a 77% bonus up to 144.00. Claim 2X! Value 166% TUESDAY! From 00:00GMT until 23:59 GMT, all members are invited to receive a 166% bonus up to $/£/€ 166.00 on your first deposit of $/£/€ 30 or more.